Internet technology is simply amazing! Like an everyday miracle it's enabling us to connect with people across the globe and in doing that we can transcend time difference and boundary with so much ease. At the same time its enabling the meeting and interaction of like minded people (which is a tremendous gift for spiritual seekers) when it comes to blog. Inspirations and Creative Thoughts is put up with the motivation to inspire other, as a reflection on life, spirituality and as collection of spiritual thoughts of great minds of all ages. It also tries to have an integral understanding of the underlying unity and spiritual essence among different faith and religions. Now the more the visitors, the greater is that joy and adds meaning to this service. It feels good that this service is reaching and more minds when there are many visitors. Over the last year, the volume of traffic to the site has increased tremendously, thanks to God. Right now the average visitors each day (24 hours) is between 250 to 300. 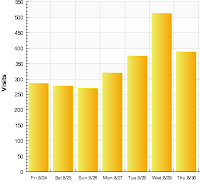 Thats about 1750 to 2100 visits each week. Curiously this Wednesday 29th Sept, the visitor number shoot record high to 512 visits in a single day! thats the highest so far. 500+ visitor in one day! imagine the power and reach of this sharing! "I came across your beautiful blog and want to thank you for all that you post. Thank YOU for being the catalyst for any good that can be brought to humanity. " Praise be to Him! I am grateful to all the visitors who continue to visit it regularly from many corner of the globe and who shared on personal note. I dont take much credit for this service, afterall, all is His. "Sadiq… You very importantly have a site that exudes the taste of love of Allah, 'ishq, that we need in such great rushing cascades now, all of us, and to spread throughout this creaky world! May Allah continue to give you the inspiration you have had..."